It was common for the early settlers to locate along a river where they could find water and timber. This village started on the banks of the Skunk River at NW Sec. 24-87-24 in 1854. It was named for the first settler, Luther Lakin. He was accompanied by Elisha Lakin, Oscar M. Lakin, and Dr. Cochran. All four men entered land and then returned back east to get their families. Luther married and returned to start the first home in Lyon Township. He was accompanied this time by Elisha Lakin, B. A. Lakin, and E. P. McCowan, who settled in a grove of trees which became known as Lakin's Grove. Luther built a log house which took him three months. In the meantime his bride cooked in a "bark shanty" which was a wooden framework of twigs and branches covered with tree bark. Today, a similar structure can be seen at the Indian Village at the Living History Farm in Clive, Iowa. The family slept in a covered wagon. The post office was established on Sept. 15, 1857 when William B. Patrick was named postmaster. By 1870 the population had reached 188. This village served for a time as a stage stop for the line from Newton to Nevada to Skunk Grove. On June 15, 1878 after some discussion as to how little mail business was generated, the post office was closed and moved to Callanan. It was suggested in the newspapers that the Callanan postmaster was a scoundrel and deliberately withheld mail from going to Lakin's Grove to make the count appear lower than it actually would have been. Like many road signs in Hamilton County, the sign indicating Lakin's Grove is not where this settlement was. The Laking's Grove Avenue road is about 6 or 7 miles west of Highway 69 instead of indicating a road north of Ellsworth. 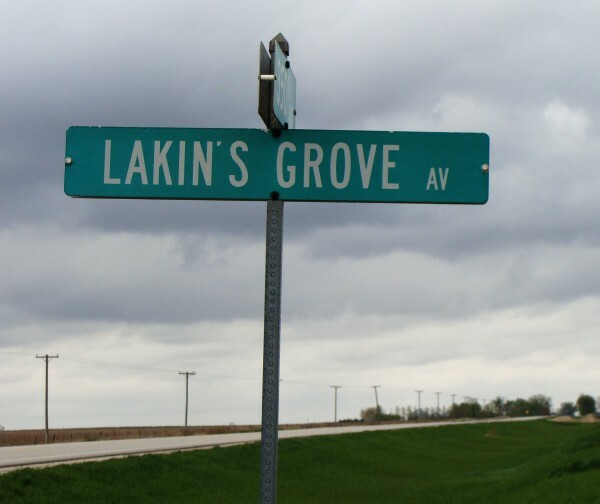 It is appropriate that there is a road with this name, because that indicates that the settlement of Lakin's Grove existed and is historically significant. 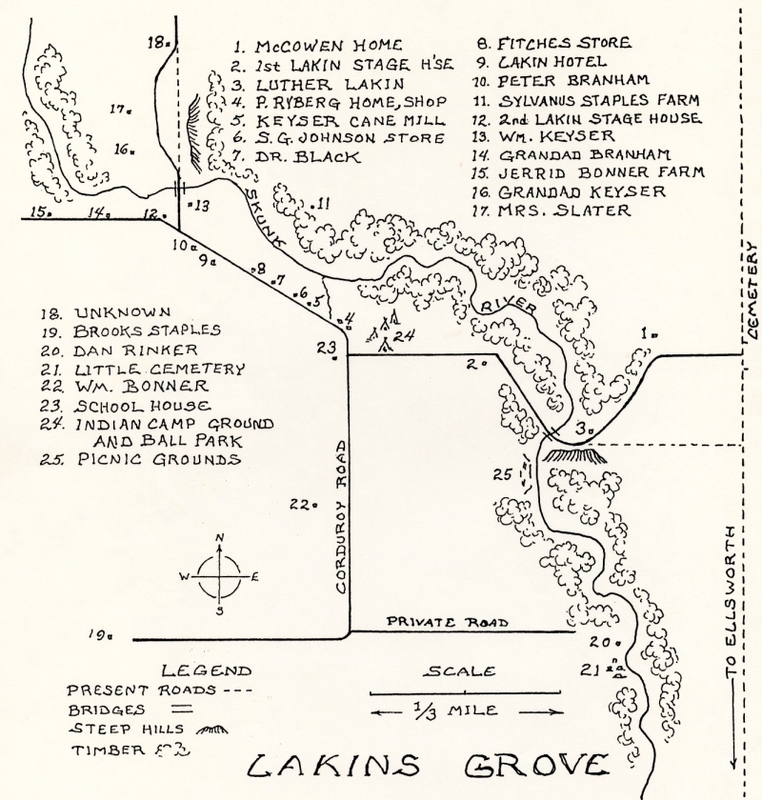 You can see, in the map above, where Lakin's Grove was located. Lakin's Grove can be found in this 1878 map shown below. Paths and trails are shown, but there is still no Ellsworth. This text is adapted from "The Centennial History of Ellsworth"
Lakin's Grove settlement was built along the early Indian trails and early immigrant trails in the southeast part of Hamilton County. It was never platted, but grew for about 20 years (1856-1878) until Callanan was developed and came to about three miles southwest of where Ellsworth is now. 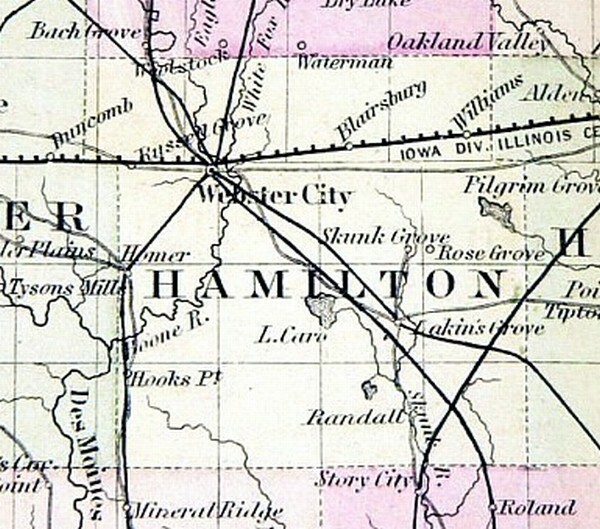 Lakin's Grove was the first settlement in Southeast Hamilton County. In 1854, Elisha Lakin; Luther, his son; a son-in-law, Dr Homer Cochran; and a relative, Oscar Lakin came from Illinois, DeKalb County, and entered claims on some land and preempted more making a large strip along the Skunk River. Then, they returned home and planned to start out again in the spring of 1855. Luther, who had recently married Emlie Staples and lived some distance from the Lakins, had made plans to start from the Staples home and would meet the rest at a given point. For some reasons, their timing was not just right and Luther Lakin and his bride arrived about two weeks before the others did in June. This made Luther Lakin the first settler. The caravan consisted of the parents, Mr. and Mrs. Elisha Lakin and some younger children; their son Brint and his wife (whom he had just recently married), and a son-in-law, Ed McCowen and his wife, Lucida. Lucida had the first been married to William Kandell and had two children, Gus and Helen, and also two children, Frank and Ann Morgan by a second marriage. The third marriage was to Ed McCowen, who came with the Lakins. They had brought with them some of the older children. This group of relatives hurriedly built a log cabin and Eveline McCown was born. She was the first baby in these parts. Later, McCown had another child and both mother and son died. Mr. Lakin contracted to carry the mail from Webster City to Mariette, the county seat of Marshall County for $500 per year. He was then a man of about 60 years of age. It was necessary for him to cross the Boone River at the beginning of his route, and then to cross the Skunk River. The first school was started about 1856. This building burned to the ground and a new one was built where the first one had been. Church services were soon held by a minister from Webster City and followed by Sunday school. These services were held in the school house. The school house was also a social center, especially after the Civil War, when farmers came in large numbers and young soldiers came west. I is believed that Dr. and Mrs. Cochran did not come until after her people did. After his house burned down, he moved to Lehigh. This left the community without a physicial for years, and then Dr. Black came, sometime after the spring of 1869. Several people, at that time, had typhoid fever. Dr. Black later moved to the new town of Callanan. Luther Lakin first buiilt a bark shanty in which they cooked and lived. They used their covered wagon for a bedroom until they built a log cabin on the hill east of the river. Here all of their sixteen children were born and it served as their home until the present house was built when Emily was a baby. Luther Lakin raised a lot of stock, especially cattle. He would herd several hundred head of cattle on this prairies. One outstanding thing that people remembered was the well and the first windmill. A tank was built with one half of it in the road for the traveling public to use. For this he was given a tax reduction. Mr. Staples evidently had more money as he bought a farm and built a frame house, the finest in the community for years. The land came to the section line on the north; but there never was a road through there, as the road only on quarter of a mile south had been established. This left the Staples farm so that they had to go through other people's timber and fort the river to get out. John Bonner, the first owner of Rose Grove, bought land of Elisha Lakin. The house was located on the fork of the road. A baseball park was created by a young soldier, who had learned the game from boys raised in the east. The clearing used by the Indians during the fall while gathering rushes and hunting made an ideal baseball diamond. The William Barkhuff family, like John Cooper, came from Janesville, Wisconisn in 1864. Near the Dan Rinker home located about one half mile east of the road going south of the Grove, and near the river where it turned south again, was located a small graveyard on the sunny hillside. There was no bridge and possibly high water was unable to get to the graveyard that the Lakins had started several years beore. Lakin's Grove was never platted, and most of the business places were located on the norht side of the road, which was all timber. View a business in Ellsworth that was moved from Lakin's Grove. The Civil War had three soldiers that called Lakin's Grove home. They were Charles Lakin, Gus Kendell (son and grandson of Elisha Lakin), and John Cooper. A number of young men came seeking their fortunes, married, and helped to build a larger community. Two of these were James Buckels and Frank Dalbey. As the Grove was in the southeast corner of Lyon Township, it soon had farmers spreading out into adjoining townships. Lakin's Grove, as a town, lived less than a quarter of a century.